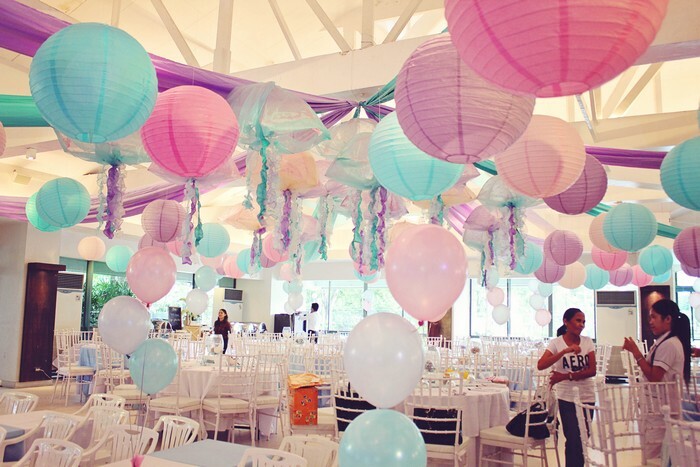 Event styling has brought about no less than a revolution in the kiddie or children’s party industry. Whereas just a couple of years ago it was commonplace to see an explosion of balloons and styrofoam backdrops, matched with a whole gamut of famous, Disney-related characters, now we are equally privileged to enjoy a more sophisticated aesthetic, painted with various themes such as Nautical, Mermaid, Baking, Transportation, and the like. 1. It is thematic and non-character based. 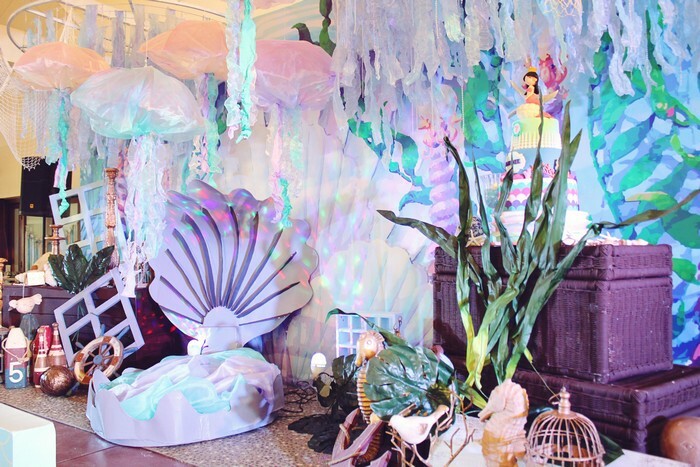 Themes have long been part and parcel of children’s parties, and will always be so, as kids love to immerse themselves in a fairy tale make-believe world full of wonder. The difference between styling and the conventional party though, is that the themes are more about general concepts rather than a specific character (such as Mickey Mouse, Cars, etc.). Our mermaid-themed party. This was so much fun! More info on the party below. 2. A cohesive and limited color scheme. In majority of cases, stylists work with a preset palette of colors. This coordinated approach leads to the strong punch of visual splendor that you feel whenever you enter a perfectly styled event. A frequent misconception about event styling is that it is all about minimalism. In other words, some people might interpret this sort of minimalism as simple, or bare. While styling does sometimes exemplify minimalism and clean lines, it is not always so, as for certain themes and occasions it may be more advantageous to incorporate a bit more orderly chaos. 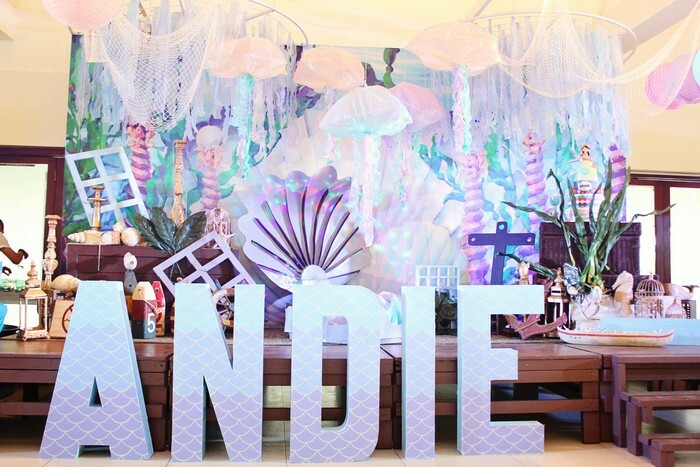 A perfect example of this point is a recent event Party Magic styled, which is a Mermaid theme for Andie’s 7th birthday. The concept of the stage itself, which aims to present an underwater scenery, is practically begging itself for a burst of imagination! What I mean by layering is the exercise of putting on levels upon levels of various props until you achieve that very deep, very full look. It is not simply putting on stacks upon stacks of any item that you can find and throwing them all in one place. The professional stylist should pay attention to various details, such as the size of each prop, placement within the whole scene, proper balancing and the like. There should be a sense to all the madness, so to speak! 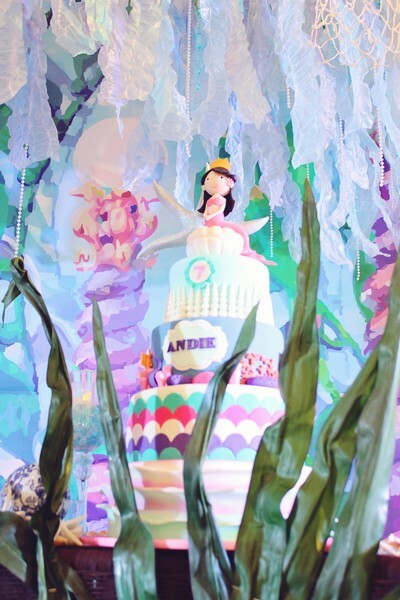 In the case of Andie’s party, the basic foundation of the background was a printed backdrop that was flat and had absolutely no texture. This was then layered upon with the treasure chests on the ground, which was then surrounded with various small and mid-sized items such as candlesticks, seahorses, buoys, birdcages, window panes, and anchors. The focal point is the slightly off-centered giant seashell. 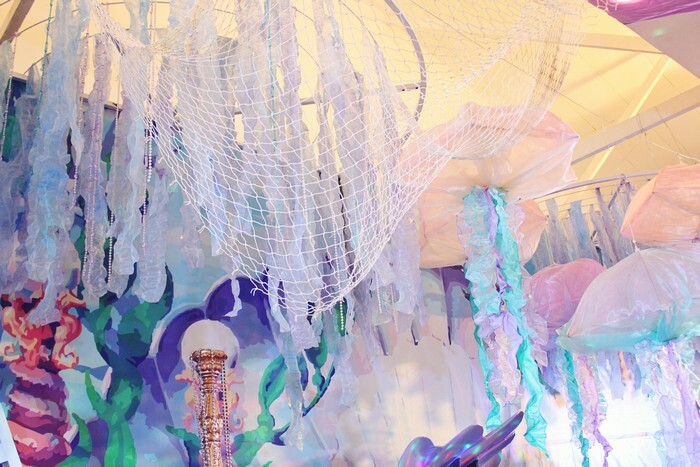 This was where we hung jellyfishes, seaweeds, and nets to create that busy look. Layering gives you the illusion of depth, and by doing these things, the graphics on that flat printed backdrop was further amplified and even appeared to have some dimension! Another favorite of mine was how the Party Magic team placed the cake. Positioned the cake as part of the scenery, and even enclosed its area with some undersea greens, as if the cake was unfolding from a dream! Besides the stage, another element that can really make your party extra special is the dessert table. The usual cupcakes and fondants are quite nice, but isn’t it more exciting to do gourmet styled desserts customized to your theme? Again, Simply Paris did an amazing job here. Just take a look at those Gradient Jello in Jars! 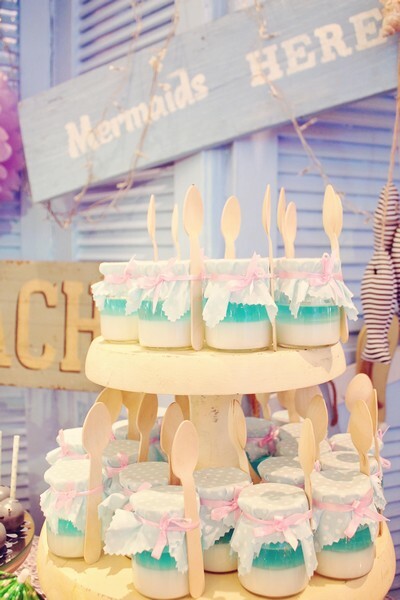 This type of dessert could work well on a nautical or beach theme as well. 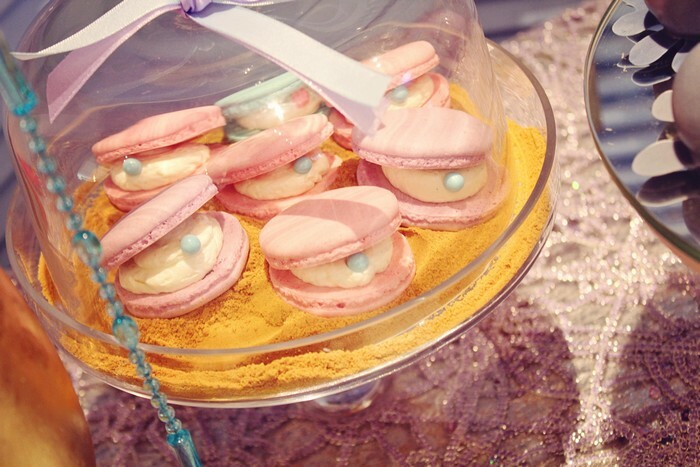 Instead of the usual macaron, Simply Paris concocted Macaron Shells, complete with pearls inside! The presentation of it is also noteworthy: the Macaron Shells were placed on top of crushed Graham crackers that were made to look like sand! 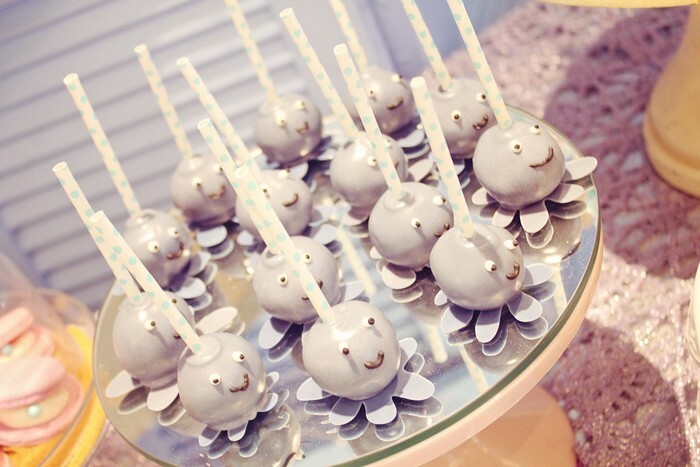 Here is another ingenious twist on the classic cake pop: Octopus Cake Pops! 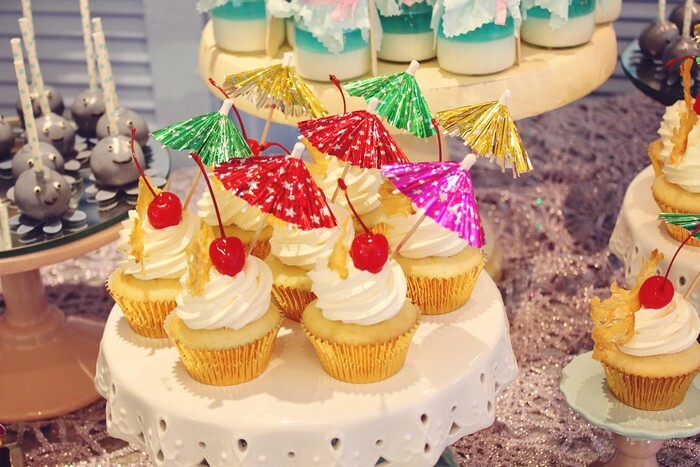 And last but not least, the Pina Colada Cupcakes! It is amazing that such a simple tweaking on a classic item (such as putting cherries, pineapples, and mini umbrellas) can completely transform its look. A happy happy birthday to Andie! Hope you had as much fun in your party as we did in decorating it! Was wondering the clam in the mermaid party was die or where you purchased. Love your parties!! !